Is Bitcoin’s Increasing Hash Rate a Bull Flag? Retracing from April’s recovery, May’s sub-$8000 Bitcoin may have injected a dose of FUD (fear uncertainty and doubt) into the crypto market. The coin’s climbing hash rate, however, may tell a different tale. BTC continues to test lower support levels, appearing to cause a downwards lilt in sentiment as investors eye the coin’s retreat. 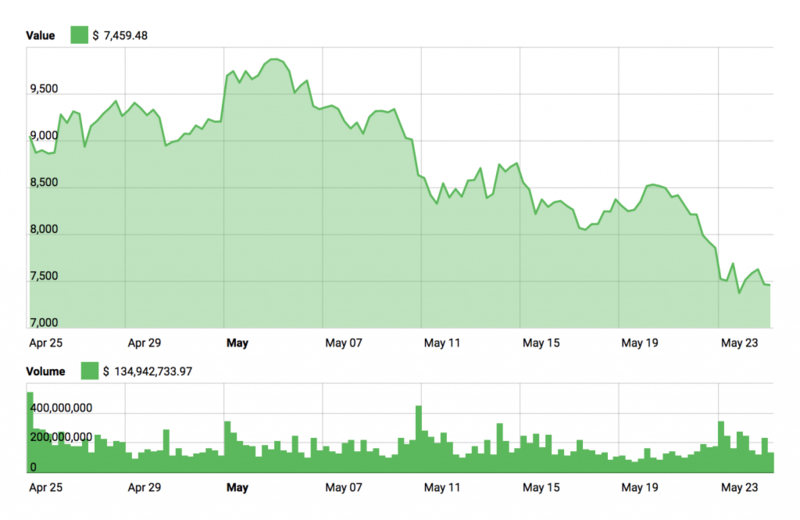 Returning once more to the $7400-mark, BTC price reflects May’s declining cryptocurrency market capitalization. Despite being engulfed in red, Bitcoin’s hash rate steadily climbs. Guessing at hundreds, thousands, or millions of calculations to solve a block — a mining unit’s hash rate reflects the number of guesses it can make in any given second when completing one of Bitcoin’s computational puzzles. Inspecting Blockchain.info’s open-source chart, the hash rate has climbed patently since early December — unfazed by January’s retracement and declining market cap. In real terms, this represents an increasing number of miners joining the Bitcoin network. All in the face of falling prices, fervor for mining Bitcoin has only inflated. An increasing number of individuals and institutions allocate their time, resources and money resources to the task — and these overheads are not negligible. While costs vary dramatically across borders, mining a single unit of BTC will cost thousands of dollars at lowest — and $26,170 per coin in the case of South Korea. An ascending hash rate: bull or bear? Many consider an increasing hash rate to be a precursor of healthy price action. While this may be counterintuitive, the explanation is simple: Bitcoin’s hash rate may be considered one of the stronger indicators of sentiment. That is to say — the more that dedicate their efforts to mining Bitcoin — the more that anticipate bullish movement. Seen alongside sinking prices, a descending hash rate would be considered a bad omen by most — miners jumping ship as they lose faith in the coin’s value. Granted, recent additions may constitute a percentage of Bitcoin’s climbing hash rate — newcomers that have no grounds in forecasting price action. Yet, monolithic outfits such as BTC.com — which alone accounts for 23.5% of all Bitcoin mining power — continue full steam ahead. Equipped with highly efficient ASIC mining units, these industrial firms often enjoy the rewards of a “scale of economy” — several firms recording multi-billion-dollar profits in 2017. Bitcoin is down 17.58% over the past 30 days. While a threat to smaller contenders, industrial mining operations require industrial investment. Once confined to Beijing, Bitmain has evolved into a multinational corporation spanning three countries. Surely such outfits answer to calculated board members — shareholders that have duly contemplated profit margins on all investments. It cannot be said with certainty that these corporate miners are prophets of price, yet their investments seem to speak volumes. In addition to upholding the integrity of the Bitcoin network, mining activity may be considered a shrewd glimpse into the future of the coin. At press time, Bitcoin’s price is currently $7473.39, -1.09% over the past 24 hours and -8.59% over the past week.